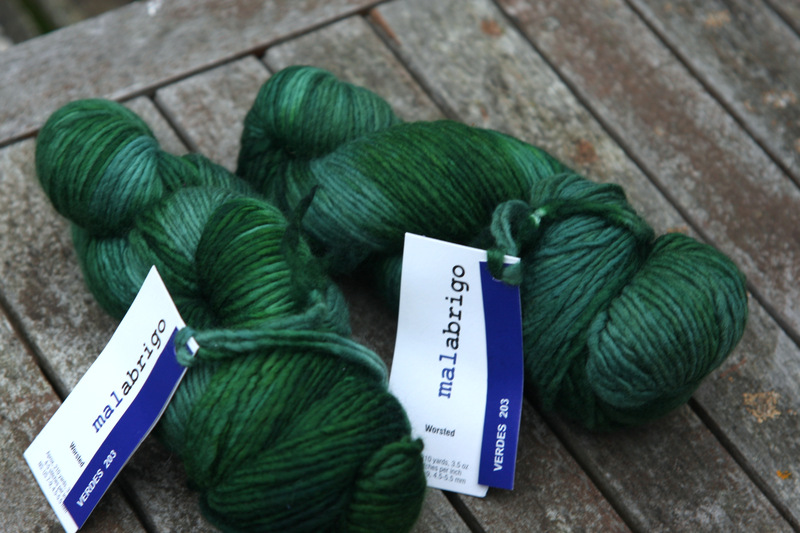 This is two skeins of Malabrigo Worsted in the colour Verdes. Shortly after I started this blog, I knit a cowl from this very yarn in this very colour. I posted about it here. I like it a lot and it gots lots of wear. 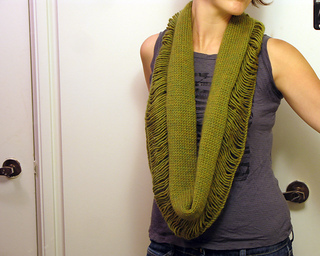 The cowl uses two skeins, knitting with two strands held together. It is easy as pie: using a size 11 US needle, cast on 131 stitches, join in the round and knit in seed stitch. Malabrigo is the coziest, softest yarn imaginable; it must be felt to be believed. I love the Destroyed Cowl by Martha Merzig. 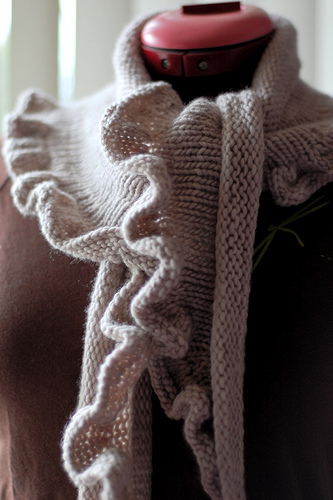 This is such a simple design, and easy to knit, but has a lot of impact. 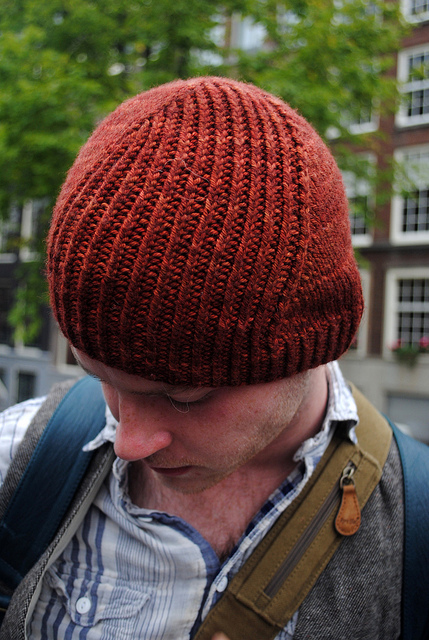 Malabrigo is a very popular yarn for hats. Here are two of my favorites. 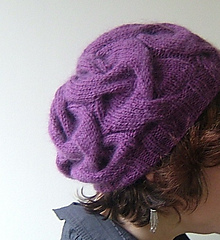 Above is the 16 Sixteen Cable Hat designed by Circé aux Belles Boucles. Below, is the wonderful Windshief Hat, designed by Stephen West. As of today, there are close to 94,000 knitted projects using Malabrigo Worsted listed in the Ravelry database. It may not have the durability of some plied wools, but it absolutely can’t be beat if you are looking for softness. To enter the contest, just leave a comment here and mention a post of mine you have enjoyed (you only need to pick one – if this is the only one you’ve read, that’s OK too). I will use a random number generator to pick the winner. The contest is open until midnight (UK time) on October 15th, 2013. As someone who lives in the UK, I am always sad to see at this point in similar contests that it is only open to readers with US addresses. This contest is valid to all readers regardless of where you live. Please make sure you check back after the contest ends, when I announce the winner. Thank you to everyone who reads the blog. I have enjoyed the whole process, and hope to keep writing for some time to come. This entry was posted in Main and tagged Blogiversary, Knitting, Malabrigo Worsted by knitigatingcircumstances. Bookmark the permalink. Happy anniversary! I loved your post about the red knit dress, it is a stunning piece and I loved the little story behind it! I have to agree with maureen15, Little Red Dress was my post of choice. I almost changed it because someone else had already picked it, but in the end decided not to. Congratulations on your blogiversary! And thank you for the generous chance to win. Some posts of yours that I enjoyed recently were your unexpected vacation posts. It was lovely to get to see a part of the world I don’t know, and it looked like you had such a lovely time. Following the crowd was a really interesting post – the shawl dilemma is something I can relate to. And your ideas in this post are really inspiring. 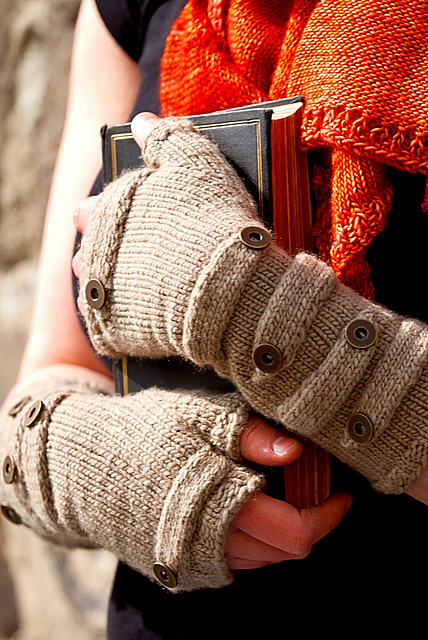 I love those Sokul mitts and they’re going into my queue too. Thanks for holding the giveaway. I loved your post a while back about how to be stupid at knitting where you thought you had the instructions down and couldn’t figure out why the pattern was coming out wonky. I’m so glad I’m not the only one….. I always love the wearability Wednesday posts, but my favourite ever was the two posts you did where you and your daughters modelled some vintage knits. I think you said your mom had made them. It was great because it was a little peak into how fashion and knitting have changed (and how they haven’t) over the years. 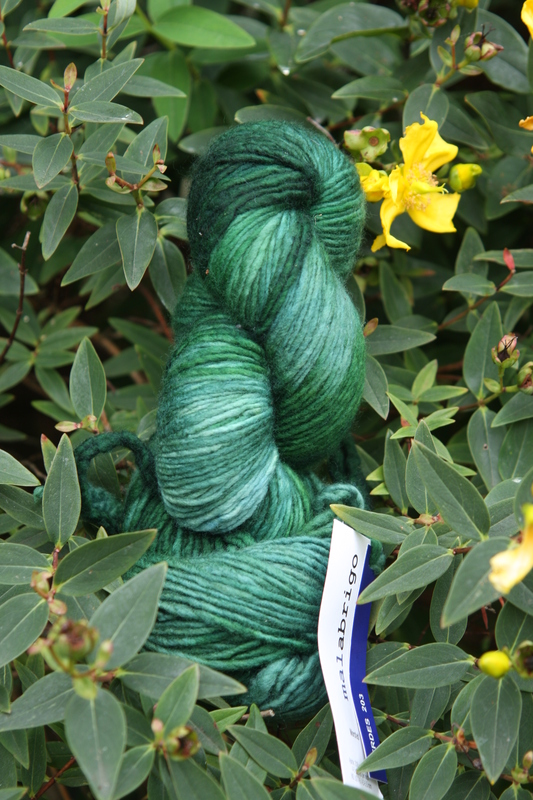 I love this last entry because I love Malibrigo yarn and I love the green colour you have picked. 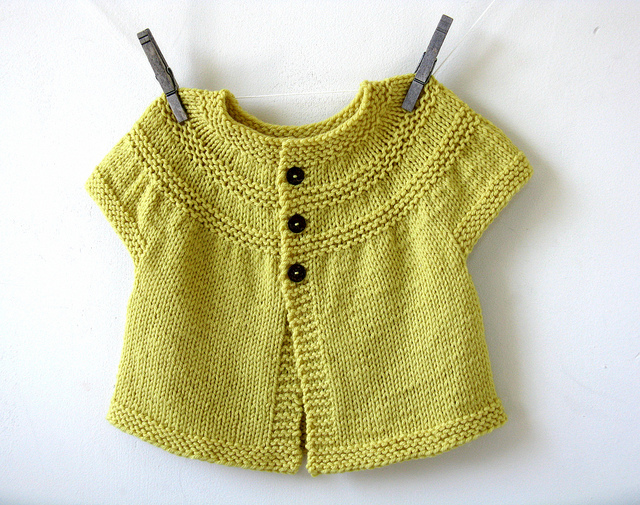 I knit a sweater for my daughter in law with it and have been yearning to make something for myself. Always enjoy reading what you are up to and seeing what patterns you are excited about. I’ve only been with you a few weeks, but I’m loving the blog. Congratulations on two years! I think my favourites would be the ‘Return of the Dress’ (who knew there were so many lovely dress patterns) and the ‘Little Red Dress’ (I really understood where you were coming from with that one!). Just found your blog and I love it! Such inspiration. 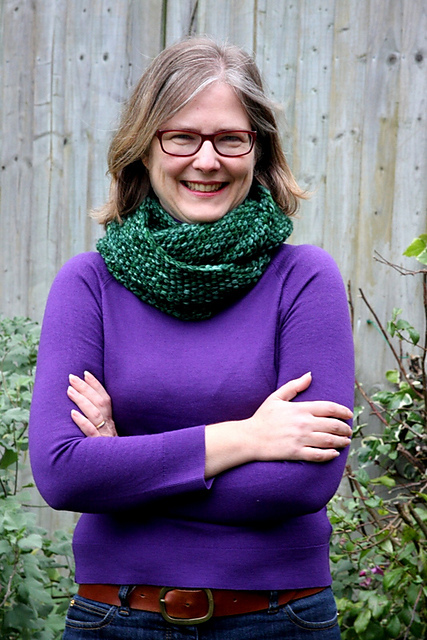 I love the cowl with the green yarns in this post. It looks so squishy and soft and the colo(u)r — gorgeous! One of my favorite posts of yours is the one with the knitted dresses. It made me sorta obsessed with the “Still Light” dress/tunic. I could see myself wearing it everyday. Kelly, congrats. As I mentioned in a PM, you have such a wonderful blog. It’s hard to pick a post, but I’d pick any one of your Wearability Wednesdays. Keep going. You are a bright spot in my life. I love reading all of your posts and especially enjoyed reading the ones about your visit to your Mom’s in Arizona showing her gorgeous knits modeled by you and your daughters and reading about the history behind the knits. Your writing style and the way you think make your blog my favorite. While my style of clothing is different (mostly due to my expanding waistline over the years), the lovely range of patterns and yarns you select and the complexity of your knitting skills amaze me. You have so much energy. And a great sense of humor. Please keep writing! Happy anniversary!! I’ve been reading (and thoroughly enjoying!) your blog for a while but haven’t commented until today… *sheepish* I really enjoyed your “Wearability Wednesday” posts, since I have knit some things for myself that don’t get much wear – it’s good to know I’m not the only one! I first got hooked on your blog last year when I stumbled across Yarngasm – the colors and photography of that blog captivated me. I went back and read all your blogs from the start and have kept up ever since. I get so happy when I see a new post. Happy Anniversary! And thanks for all your hard work. I especially love Wearability Wednesdays! Happy anniversary! I’ve read other posts on your blog about your travels and I like those. I like this one too! Congrats again! Congratulations on your blogiversary! I have to say, at the moment my favourite of your posts is the one in which you talk about putting little locking stitch markers in your knitting to mark increases and decreases. I had never thought to do that, and now I do, and it’s very helpful! I am also very fond of Wearability Wednesdays. And a happy one to me too for I have been reading your blog for the whole two years.. I love reading your post detailing how a pattern and the yarn chosen knit up and what modifications you made. But I must admit the post where you and your daughters went through your Mom’s closet and played dress up with the beautiful hand knits were my favorites. Gorgeous stitch wry definitely runs in your family. I can’t resist picking up older pamphlets and have a small collection of patterns from the 50s & 60s and there are so many patterns I would love to knit. They are still stylish and chic. 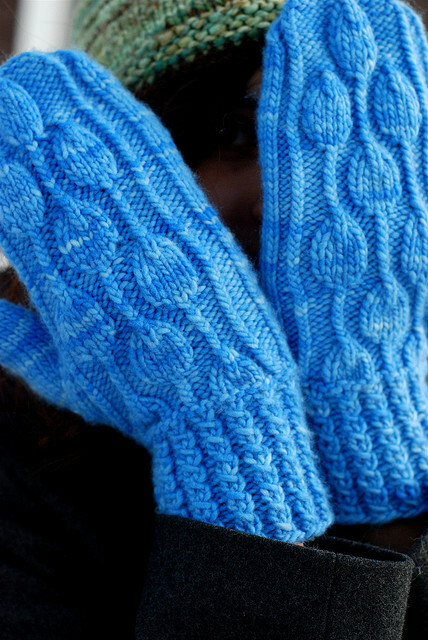 Maybe this winter will be the one that I finally get my needles clicking on an old pattern. Happy anniversary 🙂 I’ve got to agree with whatzitknitz, I loved the post where you dressed up in your Mom’s hand knits, that was so lovely. I really enjoy reading your blog and when a new post comes up in my blog reader it’s always the first I read! I love your knitting stories. Happy Anniversary! I am writing you from Majorca (Spain). (Ich habe gelesen, dass Du 10 Jahre in Deutschland gelebt hast…ich komme aus Deustschland) I love your blog and love to knit, but the most beautiful post for me was not about yarns, but about your holiday in Cornwall and Devon (September 1st, 2013). What a beautiful places!!! I wish to go there someday!! I hope you will continue with your blog for a long time, as I love to read it! Kind regards from my beautiful island! I just love the blog. I like the “when your brain takes a holiday” bit. Sometimes I feel like my knit brain as taken a huge holiday and I can’t seem to find my knit mojo again. I love the blog! My favorite entry was your original mention of the Viajante shawl, which I am happily kitting away on, using Madeline Tosh “Baltic.” I call this project my “two acre shawl!” I saw your recent entry about the progress. I have just a bit to go before starting the lace section. I found that my stitches were a bit wonky too, but I am sure they will be fine when blocked! Thanks so much for sharing your love of knitting with all of us…. Congratulations! I love so many of your posts! One of my all time favorite was the series where you and your daughters modeled your grandmother’s knits. 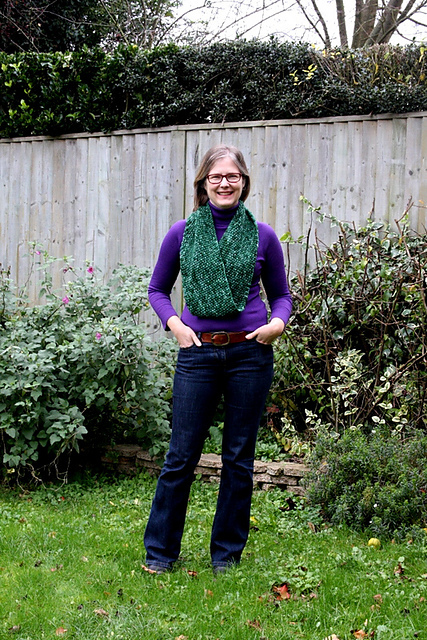 I also love the posts about styling, like the Ormulu and Audrey sweaters, and about fitting. I love them all! Hi! I found your blog through the PLucky group on Rav and I really love it! It’s new to me but I really look forward to your posts and your knitting. I LOVED the vintage dress series and I am obsessed with the Soumak wrap and am totally on the fence about starting it too, it’s gorgeous!! Congratulations on the blogiversary! That yarn is gorgeous; thank you for the give-away. My favorit posting of yours is a hard pick. I have loved your diffrent knittinprodject (and your way of telling about them), your cornwall posting brought up long forgotten memories – visitide GB when I was six… But your latest posting “now I know I’m crazy” is my choise as a favorit. Why? Lovely photos, diffrent knitting prodjects AND the way you paint the picture of your crazyness. I’t made me smile, and I wish you all the best and hope that you will have time to blogg every now and then. I liked the post you did on the knits your mom made and you and your daughters modeled them. I like the idea of the continuity of knitting down through the generations. Plus i like the fact that you work through each pattern and explain how you tailor make it to fit you or your girls. I have been knitting for about 4 years now and some of the tweaking knowledge comes with doing…and i am not there yet! I think my favourite is your Ormolu post – it was never a pattern I could have pictured myself in, but it is now. I loved the posts of the vintage outfits that your mom made. Lovely! Your entry on July 3, 2012 with instructions on the German short method changed my attitude towards short rows and I became obsessed with trying every short pattern that came my way. Thanks for that entry and all the work you put into all your blog entries! Happy Blogiversary! I love all your posts. You do a great job combining the joy of knitting exciting, interesting designs with balancing a REAL life. I loved your post about the red dress you knit many years ago. I thought it looked great on you. I also enjoyed reading about your trip to Lebanon. My husband is Lebanese, and it whet our appetite for a visit. I only follow one other knitting blog regularly. I hope you can keep at it with your new busy life. Best wishes! I love your blog and am always looking forward to a new post. One of your early posts I still remember is Stoking Flames about a jacket you knit for Leah way back in 1998 and it still fits Emma. I had a very hard time choosing my favorite and decided on Retrospective Knits part 3. I just found you today on Ravelry and have been reading about your decision to go back to school. How wonderful to be in the position of having so much in your life that you have to make choices about what to give up. I know for me it wouldn’t be knitting because it’s what keeps me sane when the rest of life threatens my sanity. I’ll keep reading to find out what you decide. I loved the post about the peerie floors hat (and especially the pictures of the hat on the dummy heads in the lab). I have been reading the blog since July, (and looking in archives) but i don’t usually comment.